Now that LeBron James has returned to Cleveland, everyone expects the Cleveland Cavaliers to win an NBA championship. That is, everyone except for LeBron James. While the City of Cleveland and LeBron fans worldwide are hopeful of a championship this year, the man who would be most responsible, LeBron James, is all too aware of painful disappointments and tough losses.Like all top performers, LeBron knows that in order to win at the highest level, you need to overcome serious failures and adopt world-class mental frameworks to succeed after difficult losses. It’s actually these very frameworks and lessons that he’s trying to provide for his teammates today so that they can win games. Fortunately for you, I’ve already distilled these extremely powerful lessons below so you don’t have to spend a full season battling with LeBron on the hardwood in order to learn them. What can we learn from LeBron’s greatest mistakes and achievements along his journey becoming the most powerful athlete in the world? In the stories below, I offer two remarkable strategies utilized by LeBron that we can apply to our own lives to turn imposing obstacles into amazing opportunities. NOTE: These are specific, actionable techniques which can be adopted and used to your advantage immediately. As an unrestricted free agent after playing seven seasons with the Cleveland Cavaliers, LeBron James and his business manager, Maverick Carter, founder of LRMR management firm and LeBron’s childhood friend, accepted an invitation to host his announcement on national television. And with that one sentence, LeBron James become the most hated athlete in America. Cleveland Cavaliers fans were the most outraged, even burning his jersey on national television. It was the immediate reaction of fans who felt betrayed by their hometown star. Cleveland fans would later rank the departure of James second only to former Cleveland Browns owner Art Modell’s decision to move entire franchise to Baltimore, after lying to the public stating that he wouldn’t. Michael Jordan, Magic Johnson, and Charles Barkley all weighed-in on The Decision, deriding the choice by LeBron James to team up with his “rivals” instead of chasing a championship without them. LeBron James became the villain of the NBA for the entire season that followed—jeered in every NBA arena he entered, except Miami’s. According to ESPN Sports Poll data, in the season after The Decision, LeBron’s favorability plummeted from 15.6 % of respondents calling him their favorite player to only 10.4 %. To make matters worse, the Heat lost in the NBA finals that year to the Dallas Mavericks. And, it seemed, everyone was pleased. LeBron’s favorability dropped even further to 9.4 % in the following season. This, for an athlete that wasn’t caught cheating at his sport, taking performance-enhancing drugs, caught in infidelity in his marriage, or in any trouble with law enforcement. So how does LeBron feel about The Decision now? According to his recent interview in GQ magazine, LeBron weighed in once more on The Decision. Everything promoted a sense of ease for him. Everything made him comfortable. What LeBron needed was to become uncomfortable. And that’s exactly what The Decision offered LeBron: an opportunity to become uncomfortable so that he could transform and evolve. As a result of the overwhelmingly negative attention LeBron received, he was forced to assume a different perspective because he was no longer able to be the LeBron James that everyone perceived him to be all his life—well-liked, jovial, and outgoing. At first he accepted the role of a villain. Playing to fans on-and-off the court, inciting further negative exchanges from the booing crowds, and avoiding members of the media and others after his games. But after he lost in the finals that season, James spent the next two weeks in a room mostly by himself, taking to almost no one. It was one of the lowest moments in his entire life. He decided to go back to the playing the game the way he knew how – with fun and full of joy. But one important thing changed – he no longer remained sensitive to what others had to say about him. LeBron employed a “reversal.” A reversal is overcoming the negative of a particular fear and flipping it on its head so that it can lead to a much stronger positive quality, such as self-reliance, patience, supreme self-confidence, and so forth.This is a powerful psychological concept used by leaders such as Napoleon Bonaparte and Steve Jobs, which has very practical application and real world effects. To do it, LeBron reversed a seemingly bleak situation into an opportunity for complete freedom by mentally reframing his circumstances and manipulating his responses to them. This simple reversal gave him more power to control his own fate and more freedom of action—completely unencumbered by the opinions of detractors. Here is the paradox of a reversal – you mentally transform a negative event into an opportunity or challenge, providing you with more internal power and motivation. As a result, you care less of what people think about you, paradoxically causing them to admire you more. NOTE: All circumstances can be converted and turned into opportunities. Psychologists sometimes refer the difficult experience that LeBron went through after The Decision as “adversarial growth” and “post-traumatic growth.” The struggle against some obstacle propels the individual to a new level of functioning. The extent of their struggle determines the extent of their growth. The obstacle becomes an advantage. In LeBron’s situation, he learned that people were going to dislike him anyway, despite how he acted or didn’t act in accordance with their expectations. So he figured he would act as himself and live with the consequences since it wouldn’t alter public opinion anyway. Only winning, he felt, would do that. What LeBron had to do was overcome his fear of being uncomfortable. Do you think this nightmarish experience prepared him for major decisions like deciding to opt out of his contract with the Miami Heat earlier this year to return to Cleveland, despite outside opinion? He carried this critical lesson with him to create even more freedom of action and take further control of his fate in matters on-and-off the court, including his mega endorsement deals and his global icon plan. Understanding and applying this simple psychological concept to your unique problems can make all the difference in turning a seemingly overwhelming failure into a complete success. To do so, you need to identify possibilities to employ reversals in similar areas of your own life. We can accomplish this by noticing the opportunities to convert negative circumstances, such as not earning the raise we expected or being passed over for a promotion, and turning those into a powerful opportunities to create new opportunities for ourselves. These new circumstances become valuable occasions for us to make progress on our own goals despite objections from the outside. The opportunities are all around us. We just need to adopt the proper mental frameworks to take advantage. Lesson learned: You can turn your worst trials into your greatest triumphs through the power of reversal – overcoming the negative of a particular fear leads to a positive quality such as self-reliance, patience, or supreme self-confidence – and use the experience to your advantage by growing in proportion to your struggle to a new level of functioning through adversarial and post-traumatic growth. LeBron James is arguably the most athletic player to ever play in the NBA. His speed, power, and agility is unlike anything we’ve ever witnessed in any player his size. In any sport, really. At 6 feet 8 inches tall, he simply shouldn’t be able to perform, with skill, the acts that he does. In recent years, his current coach, Miami Heat’s Erik Spoelstra, donned LeBron with the moniker “NBA’s Swiss Army Knife” for his ability to guard every position on defense and play multiple roles offensively. But he didn’t always have this ability. LeBron identified the gaps in his ability and what his team required of him in order to win championships. And then he worked at it. Tirelessly. LeBron analyzed his team’s performance in the Finals to identify the gap between where their team was currently performing and the level they needed perform at in order to win a championship. LeBron immediately began working to make dramatic improvements in the area of post play by working out with one of the all-time greats to enhance his low-post game, Hakeem Olajuwon. His improvement in the post contributed to increased shot efficiency all over the floor. Take a look at the shot chart below comparing LeBron’s final year in Cleveland during the 2009-2010 season to his first year in Miami during the 2010-2011. In his last year in Cleveland, LeBron took a lot of three point shots. For a player of his size and strength, he’s not utilizing his physical gifts most effectively when he’s shooting outside of the arc. Also, he took a lot of mid-range shots (low-efficiency) and some near the basket (high-efficiency). During hisis first year in Miami, LeBron better leveraged his physical gifts by taking more shots inside of the arc. He increased the volume of shots taken near the basket for a higher percentage of shots made and reduced the volume of three point shots taken. However, his Miami Heat team still lost in the Finals to the Dallas Mavericks. Now, let’s take a look at his shot chart the following season after LeBron worked with Hakeem Olajuwon to improve his post play. For his second year in Miami, LeBron significantly reduced the volume of three point shots taken. There’s only one dot outside of the arc for this year. Additionally, he increased the volume of shots taken at the low block on the left side. This new concentration of shots taken on the floor represent an addition to LeBron’s game. This is where his work on the low post with Hakeem paid off. To make sense of these shot charts, let’s put these numbers in perspective. In LeBron’s rookie year, he shot 42 % from the field and 29 % from beyond the arc. In his second year in Miami those numbers rose to 53 % and 36 %, respectively. An impressive feat for anyone! And it turns out it was just what they needed to win his first championship. LeBron continued his improving efficiency rising to 56 % from the field and 41 from beyond the arc the following year. The best part of LeBron’s increased efficiency on offense is that the effect wasn’t limited to just LeBron; it affected everyone on the team. 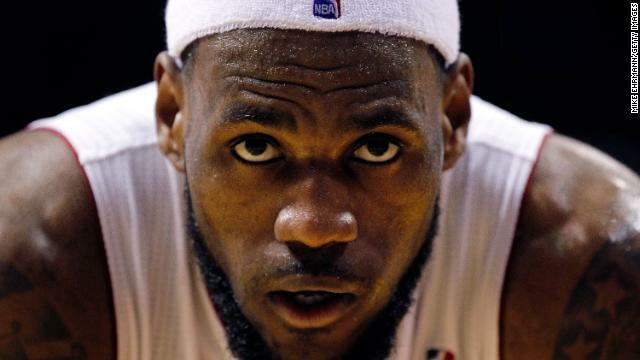 Here’s the thing – LeBron was already head-and-shoulders the best player in the world. Many analysts even questioned just exactly how LeBron could actually become any better. Where the vast majority of people get better for a while and level off, reaching the limit of their abilities where even years of additional work have not made them any better, LeBron made dramatic improvements in one off season that resulted in a world championship. You can see how much feedback, detail, and intensity is interwoven throughout LeBron’s workout to make progress on his goal. And every element of the deliberate practice criteria is met in LeBron’s workout, ensuring that he’s getting better with every repetition. Now, let’s talk about how this applies to you. LeBron may not have known he was following the requirements for deliberate practice in his workouts. However, chances are, he knows EXACTLY what deliberate practice is, and he’s implemented it for years to become better at his craft. So have others like Kobe Bryant, Mozart, and Picasso. Have you? Well, chances are you didn’t know that researchers confirm that the top performers in every industry engage in and are committed to deliberate practice. It’s not merely that top performers are “putting in the hours.” No, it’s that top performers break down the skills that are required to become an expert and focus on improving those skill chunks during practice. You can start today to analyze the gaps in your performance relative to where you desire to perform. Then use the same criteria outlined above to ensure you’re following the necessary framework. Michael Jordan fans are quick to rule out this possibility, but there’s no doubt that LeBron is putting in the practice and positioning himself the way he feels gives him the best opportunity. And while LeBron recently lost to the San Antonio Spurs in the NBA Finals as a member of the Miami Heat, he will again use the lessons conveyed above to learn what’s required of him to win another championship with the Cleveland Cavaliers. Being the best in any profession isn’t about being the most talented; it’s about adopting the mental frameworks and practice habits that the best use to become great. And by leveraging the power of reversals and committing to deliberate practice, you’re provided with elite strategies to turn obstacles into opportunities. ‘The 50th Law’ by 50 Cent and Robert Greene discusses the powerful role of reversals, along with other strategies and tactics for success in life and work based upon a single principle – fear nothing. He utilizes several examples of leaders who have overcome adversity through understanding and practicing the 50th Law, including Napoleon Bonaparte, Malcolm X, Rubin “Hurricane” Carter and more. ‘Talent is Overrated: What Really Separates World-Class Performers from Everybody Else’ by Geoffrey Colvin details the concept of deliberate practice. Backed by scientific research, it shares the secrets of extraordinary performance and shows how to apply these principles. The book features the stories of professionals who have achieved world-class greatness through deliberate practice, including Benjamin Franklin, Chris Rock, Jerry Rice, and others. ‘Flow: The Psychology of the Optimal Experience’ by Mihaly Csikszentmihalyi describes the process for Flow, a term used to describe the optimal experience of experience deep enjoyment, creativity, and a total involvement in an activity. Bonus points if you made a connection between the requirements for deliberate practice and the process for Flow, except it not being much fun.